I was attracted to these boys while trawling ebay for portraits, as I frequently do. My penchant for creepy child portraits seems to have honed my scouting radar. This one caught my eye because of it’s charming, naive appearance. Such sweet faced boys. Twins maybe? Definitely brothers. Still eerie though. This seems to be inherent with child portraits. I bid and won. I was the only bidder. My talent for spotting portraits that no-one else is interested in had paid off again! A quick google search and I am astounded by the search results! Looks like this Sorolla chap is famous. Can’t be the same one surely. To my shame, I have never heard of Spanish artist Joaquín Sorolla y Bastida, but his paintings are certainly familiar. Curiously, the seller did not play up on the potential provenance of the signature, and no other bidder seemed interested either…possibly because this portrait is nowhere near as accomplished, or indeed anything like his style. The real Sorolla’s paintings have dynamic movement, not only in the figures, but also in his impressionistic brush strokes. And those vibrant colours are certainly a common motif. His work has passion. The figures in my painting are much more stiff and naive in style, and the colours bland. But my beige boys have such bonnie (albeit flat) faces. They seem such nice boys, and studious too. Are those Greek letters Kappa and Pi on back of their books? I type these words into Google and discover that ‘Kappa Pi’ is in fact a fraternity art group founded in 1911 at the University of Kentucky in Lexington, Kentucky, by like minded students who wanted to paint together. It then became an honorary society in 2018. Curiouser and curiouser! Are the Greek letters just a coincidence, or is this in fact an American painting dated after 1911 by a Kappa Pi fraternity student who admired Sorolla’s work? If so, this is not exactly a useful lead for connecting my painting to the real artist. 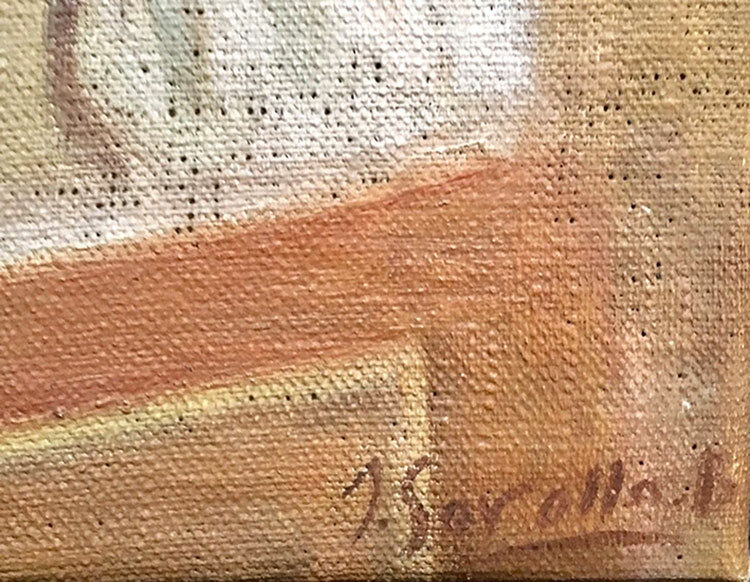 I will proceed on the assumption that this is not by Sorolla’s hand. No surprise there then. But I have to ask myself, why is an American artist faking a Sorolla, and making no attempt whatsoever to match his style? Who’s he trying to kid? Is there a chance it could be an early work of Sorolla’s? Maybe from a time when he was starting to learn his craft at the age of 14 maybe? Could my boys be school chums, sitting for Joaquin while he practiced? That signature certainly does match. However, a signature is much easier to fake than an artist’s skill and style. And would he really still be using the same signature from his teenage years into his adult career? The Antiques Roadshow is visiting Cardiff in September…so I’ll attempt to find out then. I have even written to them in case I can stir anyone’s curiosity to take a look at it in advance. Whatever the outcome, I am pleased with my new children. Such sweet faces (but I know I will have to remove them from the guest room wall if my nephew visits!). UPDATE: I visited the Antiques Roadshow the other weekend and as I suspected, my painting is of no worth whatsoever! My expert was suitably unimpressed. I almost had my 30 seconds of fame though when he tried to find a cameraman to film one of my other paintings, but returned empty handed when he couldn’t find him…booohh!! !